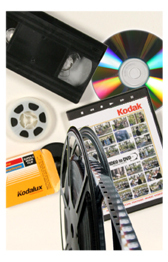 We transfer your old home movies to DVD or VHS. Before transferring your precious movies, we prepare them by cleaning them and editing out any lengthy blank sections. If your Super 8 or 16mm movie film was recorded with a soundtrack, we can transfer the sound along with the video images. Background music can be added from our library of royalty-free music. Click on the Price Page link for complete details about our Movie Transfer Service.